A Rockford (IL) police officer died from injuries suffered during what the Rockford police chief described as a "scuffle" with a man at a traffic stop early Sunday morning. The suspect died in a car crash immediately after the stop. 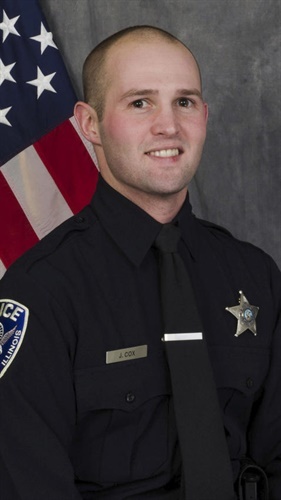 Officer Jaimie Cox, 30, made a traffic stop in Rockford about 1 a.m. Sunday before making a "brief radio transmission indicating he needed assistance," police Chief Dan O'Shea said at a news conference. Rockford officers responding to the scene found Cox, who was critically injured, near a single-vehicle crash about two blocks north of the initial traffic stop, O'Shea said. Officers also found another man dead inside a vehicle. Police identified him as Eddie Patterson, 49. It is believed he is from Rockford, police said. “The preliminary results of the investigation indicate that Officer Cox was involved in a scuffle during the traffic stop that resulted in the officer becoming entangled by the suspect vehicle,” O’Shea said during a news conference Sunday afternoon. About 1:20 a.m., Rockford police said on Twitter that officers were at a "scene of a shooting involving an officer." O'Shea initially would not say whether anyone was shot. The later statement from the department said it is believed Cox fired his weapon, the Chicago Tribune reports. An investigation is under way, but it appears Officer Cox might have been dragged by the suspect's vehicle, which caused his mortal injuries. He apparently fired at the driver, which may have caused the crash.